Home Blog What To Expect From A Pain Management Doctor? What To Expect From A Pain Management Doctor? We all must have visited a doctor for pain at some point of our lives. 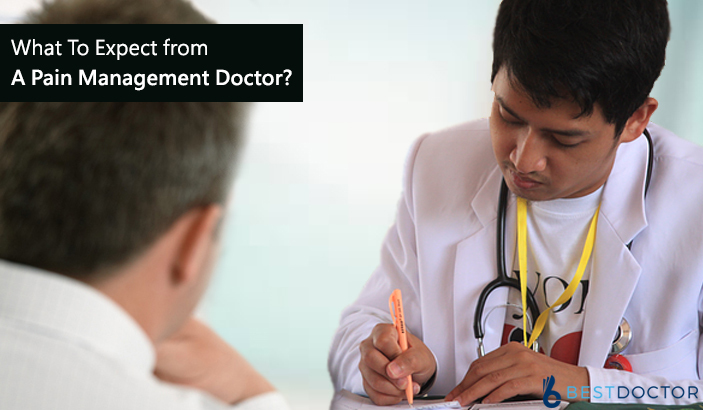 It is the most common complaint for which patients seek help from a healthcare professional. Pain can be described as an unpleasant sensation which is localized to a part of the body. The type of pain depends upon part and extent of the body affected; likewise, it can be acute or chronic depending upon the duration since which it is present and underlying cause responsible for it. Untreated acute pain can have serious clinical complications, while chronic pain greatly affects the quality of life. Pain can often become crippling and severe that hampers a person’s daily functioning. It is therefore extremely important for a patient to visit a doctor for pain. The field of pain management has been increasingly popular among doctors as well as patients due to increasing awareness among patients regarding untreated pain and increase in the prevalence of painful conditions such as neck pain, low back pain, and fibromyalgia and so on. Pain management doctor is a person who specializes in managing pain due to various causes. The prime aim of a pain management doctor is to provide relief from pain and discomfort by treating the underlying cause and to improve functionality where it has been hampered. Appropriate screening tools to test for use or abuse/ side-effects of drugs and medications. Physical examination including examination of the cardiovascular, respiratory, nervous and gastrointestinal system. How and when did the pain start? – This will help to understand the triggering factor for pain. When is the pain worse or better? Does the pain radiate or is it well localized? Type of pain – Pain may be of nervous origin or psychotic or due to an underlying tissue destructive process. Duration of pain – Since how long has the pain been present? Psychosocial evaluation may be done for patients presenting with chronic pain. Use of appropriate diagnostic tools such as blood tests and radiological examination where the cause for pain is unidentified. Adjuvant analgesics including anti-epileptic drugs, tricyclic antidepressants and local and regional anesthetic agents. Non Pharmacological Approach – This approach is recommended as alternative therapies which can be used along with conventional medicine for pain and not as a replacement for it. Patient education regarding their condition and possible complications, medications and their probable side-effects. An ideal pain management therapy will be a comprehensive, tailor-made approach towards each individual’s case of pain which includes conventional medical management along with suitable physical therapy and rehabilitation. Previous PostHow To Ask Your Doctor For Pain Medication? Next PostWhen To See A Dermatologist For Acne?